The United States Air Force flag was officially adopted by President Harry S. Truman on March 26, 1951. The ultramarine blue background and gold lettering represent the colors of the Air Force. The crest portrays the American bald eagle symbolizing the United States air power, and the cloud formation behind it depicts the creation of a new sky protected by the Air Force. The wavy line dividing the bottom of the shield below the eagle represents clouds being charged by the heraldic thunderbolt of air striking power surrounded by smaller lighting flashes and wings. 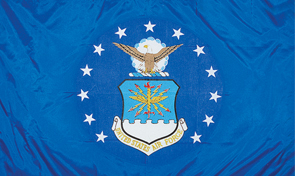 The words "United States Air Force" appear along the bottom of the shield. The thirteen stars stand for the original colonies, and the three grouped stars above the eagle represent the three Departments of the National Defense Establishment, Army, Navy, and Air Force.